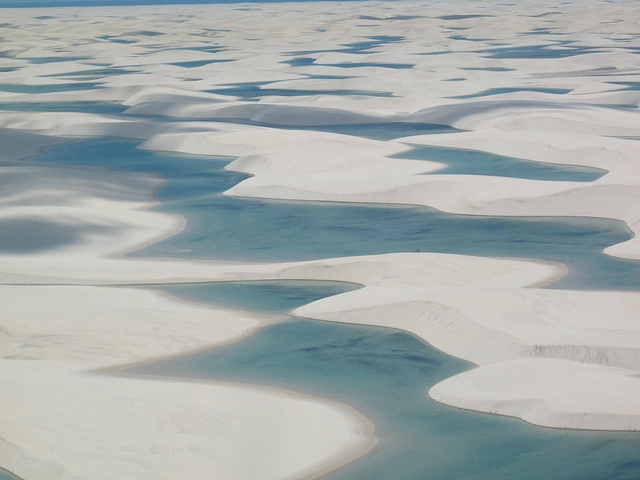 When you first see it, Lençóis Maranhenses in northeastern Brazil appears much like a typical desert: sand – and lots of it. 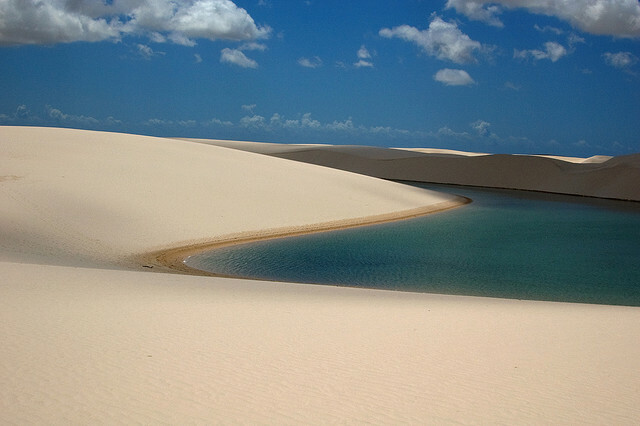 Yet closer inspection quickly reveals pools of water among the ridged hills of sand, lining the landscape with their rich hues of green and blue. 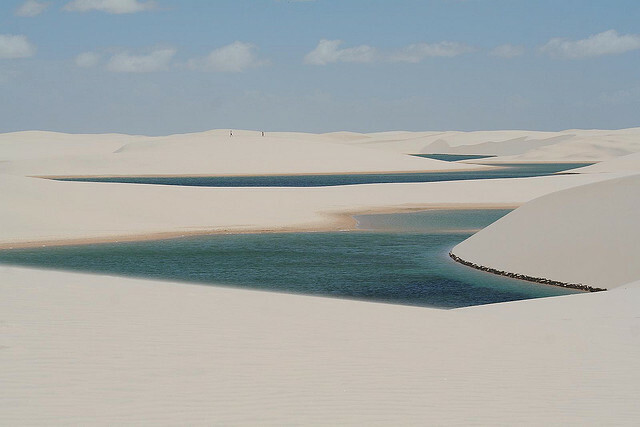 One of the most visually contradictory sights on our planet, there are lagoons among the dunes. 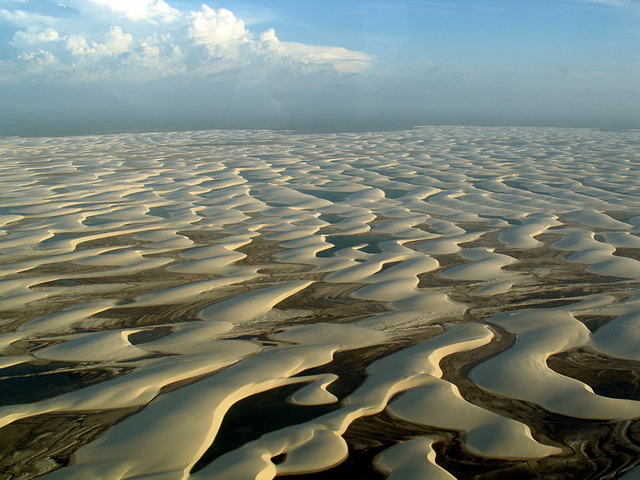 In fact, strictly speaking, Lençóis Maranhenses is not even a desert. 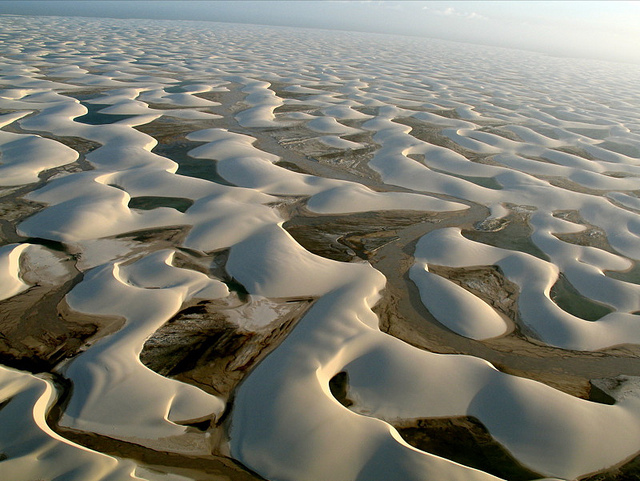 It is situated just outside of the Amazon Basin and it has a rainy season which helps to cause this strange phenomenon. 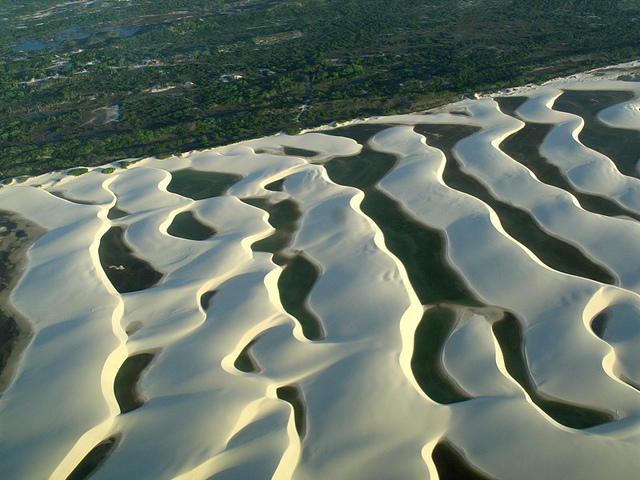 The long, small valleys (more properly described as depressions perhaps) between the dunes fill with fresh water each year and, particularly between July and September, form their own out of the ordinary ecosystem. 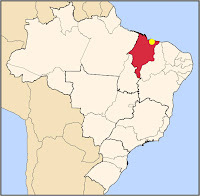 The area, consisting of approximately six hundred square miles, is virtually free of plant life. 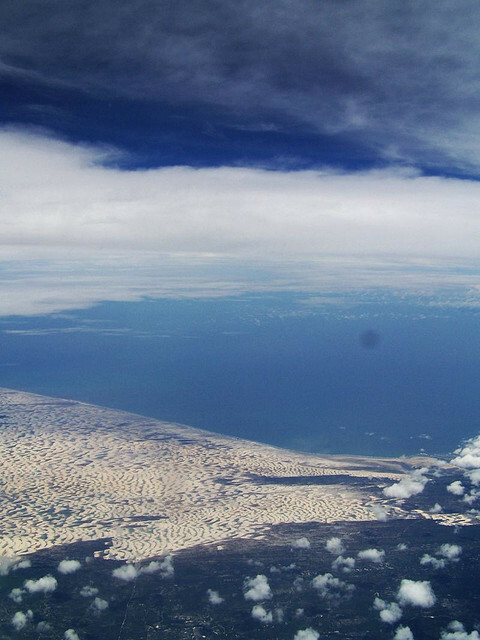 Perhaps the best way to take this amazing landscape in is from the sky. 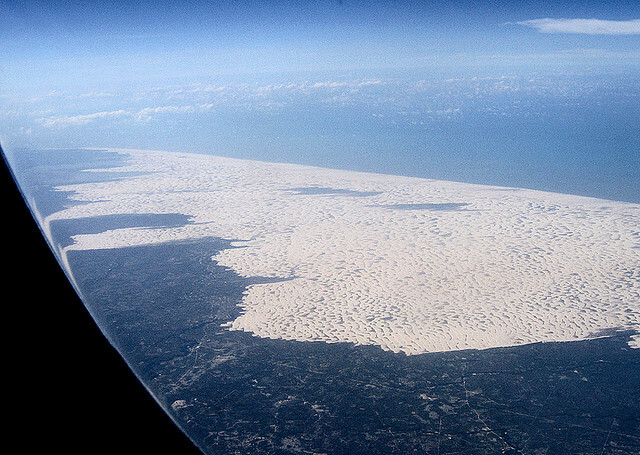 From a distance it looks as if giant worms have been worrying the land. 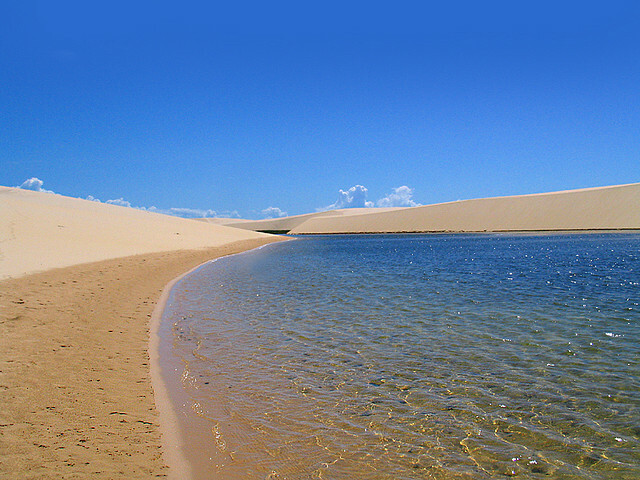 Then, as you near the area, the lagoons in the dunes become clearer. 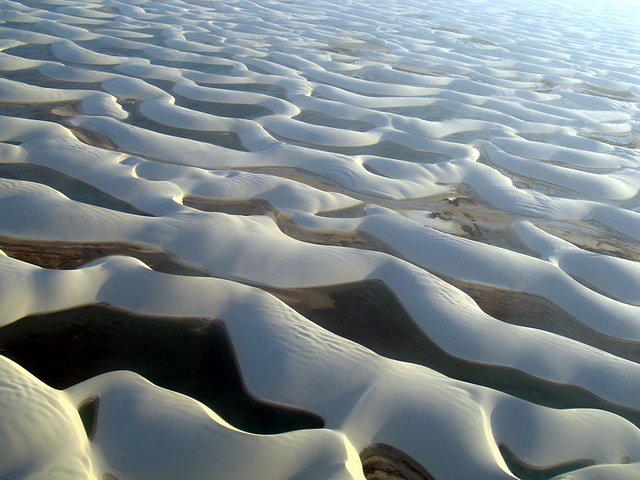 It is an other-worldly sight. 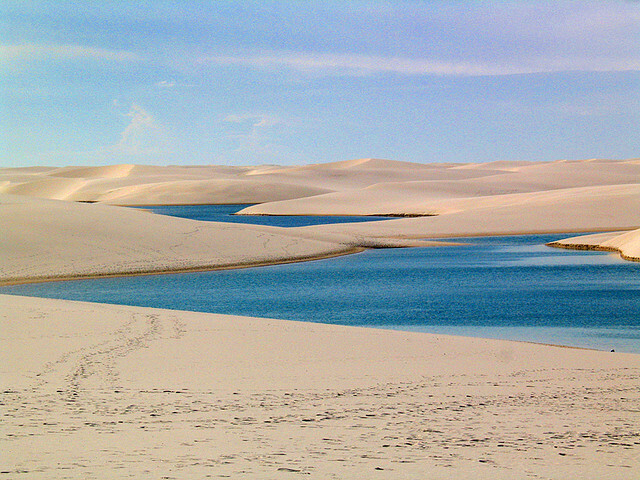 The desert-like landscape is all the eye can see with the pools of water providing the only color among the dazzling white of the dunes. 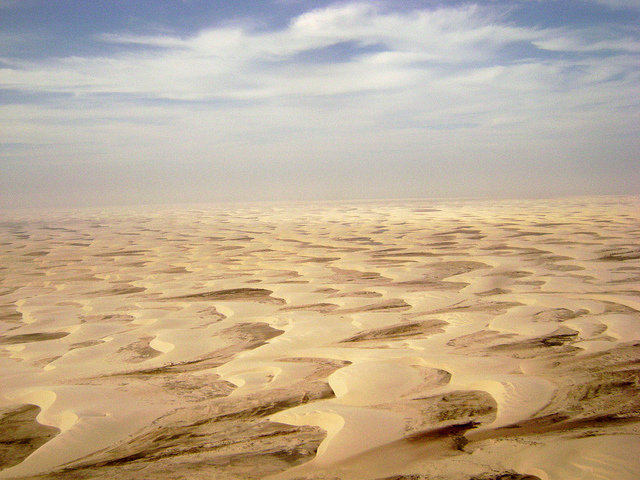 At its edges this 'desert' comes to an abrupt end. Bizarrely these constantly shifting lagoons (which virtually disappear in the dry season) are the home to a wide variety of fish. It is thought that their eggs were brought to the lagoons in the feathers and on the legs of birds. 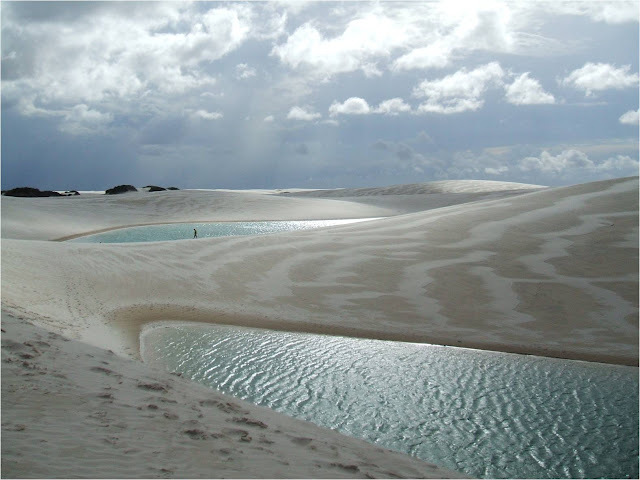 Although the area has been a national park since 1971 it has been designated so to ensure the ecology of the place remains intact. There are small communities within its borders which draw their income from the lagoons and their fish. In the dry season (above), however, these small communities vacate the area and rent land outside the park on which to cultivate vegetable crops. 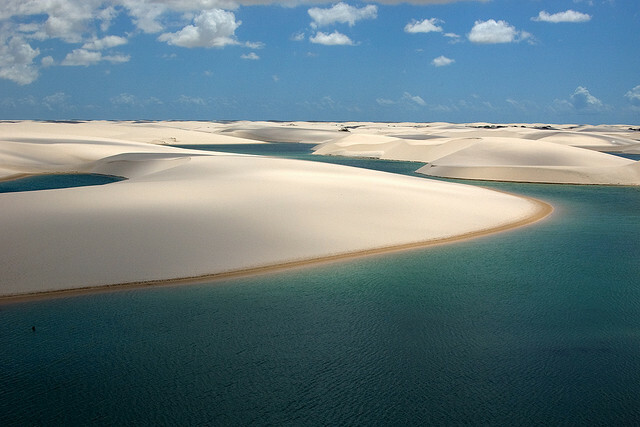 Despite not being a desert the place has a nickname – the Brazilian Sahara. 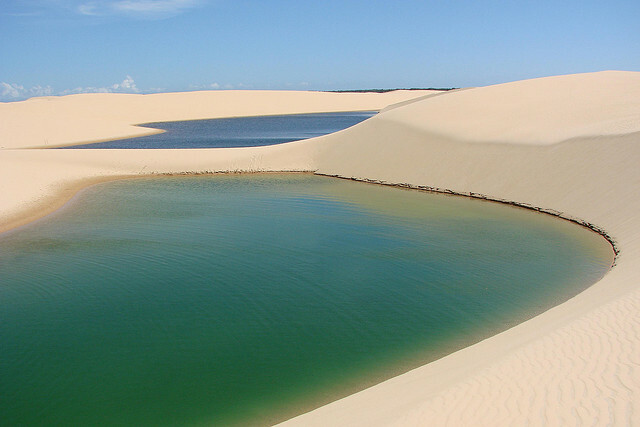 Yet those lakes of crystal clear water between the dunes make this, perhaps, a stranger place than the vast African wilderness after which it gets its nickname. 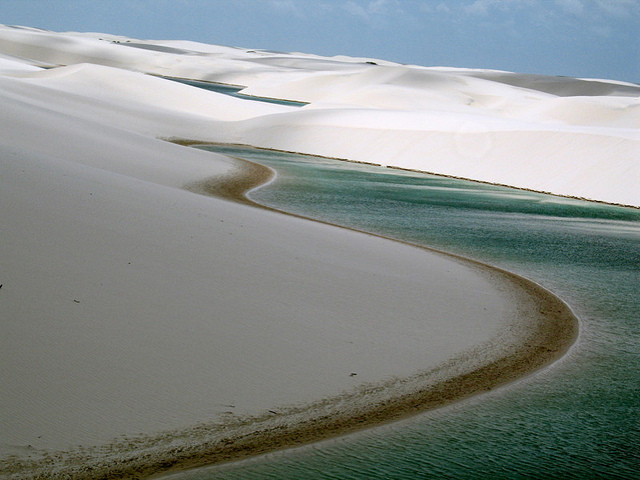 Lençóis Maranhenses was formed over millennia: sand from riverbeds is deposited at their mouths then returned inland by wind and currents. 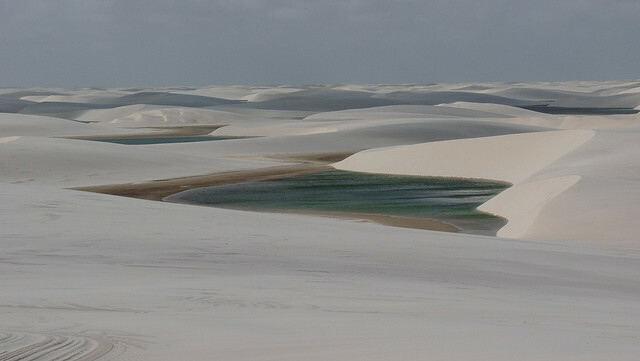 The name translates as bed sheets, which despite the beauty of the place, is so called because the land cannot be used for anything other than subsistence fishing. 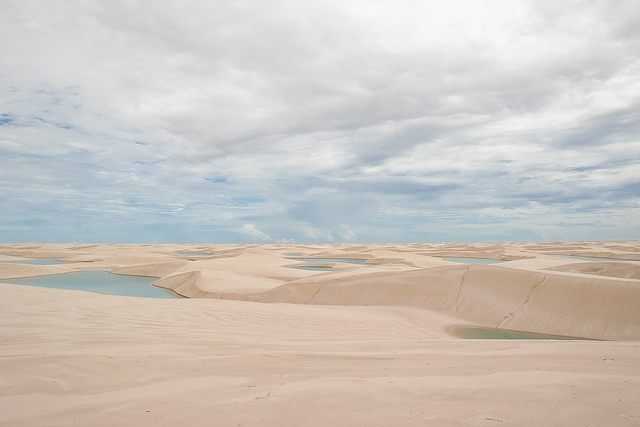 Local legend has it that the Caeté Indians, the original inhabitants, woke up one morning to find their entire community swathed in sand, perhaps as some punishment from the gods. 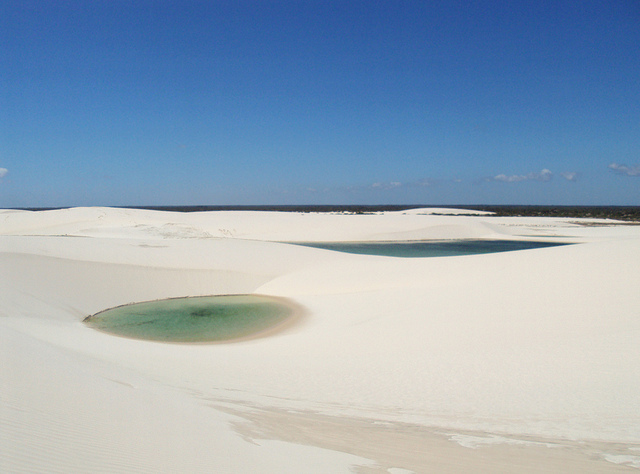 This extraordinary landscape is still little visited as northeastern Brazil does not attract as many visitors as the more populous and popular south. 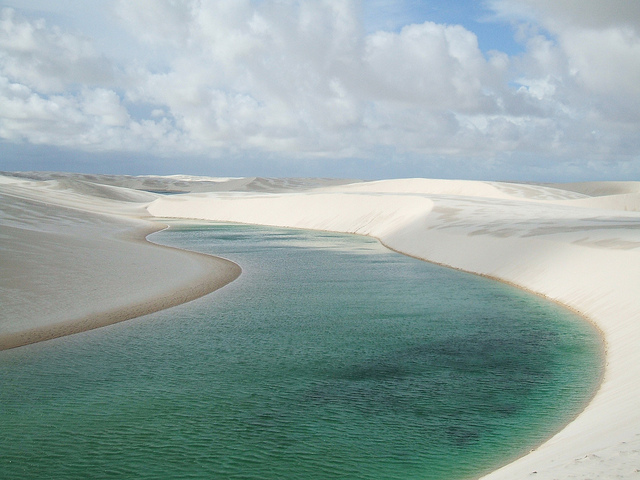 Yet, even though that means that the dunes are a three hour journey by 4x4 away from what you might consider civilization, for those that make it to Lençóis Maranhenses that can surely not be too much of a bother.